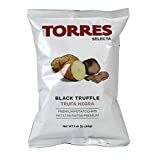 When you combine crunchy potato chips with a bit of the bubbly, you get these cool new Torres Sparkling Wine Potato Chips. 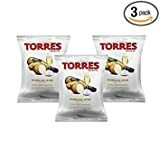 These gourmet potato chips are infused with sparkling wine to give them a sweet flavor and are fried in high quality Spanish oil for a deep, crispy crunch. They're perfect for serving to guests on New Year's Eve, on romantic evenings where you may be eating chips for some reason, and I'm sure they pair well with actual sparkling wine anytime you need a tasty snack.